With the advancement of NAND technology and competition in the market, manufacturers are bringing more advanced SSDs at an affordable rate into the market. Unlike a few years ago, SSDs are very affordable now, as the technology has come to the mainstream. The Plextor M8VC is a SSD that aims to capture the mass market. It comes in both 2.5-inch and M.2 form factors and is positioned to provide both great performance and value for money. While we have touched on quite a number of SSD technologies in our previous review of the Transcend SSD230S, the Plextor M8VC SSD tackles the problems of TLC NAND based SSDs with their own set of solutions (or perhaps, with their own naming conventions). Specifically, their SSDs are all built in with LDPC Technology (Low Density Parity Check). As memory designers increases the number of bits stored per cell to achieve increase density, the endurance level of the SSD decreases. To counter this side effect, the Plextor M8VC uses LDPC to reduce the number of errors, so as to extend the lifespan of each cell. This is also why each of these drives are rated to have a MTBF rate of more than 1,500,000 hours. In fact, you would not even worry about the SSD failing on you. To further increase the SSD’s performance, Plextor has also included an additional DRAM to cache the frequently used data. This reduces the speed differences between the system memory and secondary storage, thus allowing quick access to the required data that is required. The 2.5-inch version of the Plextor M8VC SSD looks just like any other SSD in the market. However, we realised that it weighed much lighter than usual SSDs. Just out of curiosity, we removed the enclosure for the 2.5-inch drive and found out that the actual PCB only takes up less than half of the whole package! Both the M.2 and SATA versions uses the same components. We can see that they are utilizing the SMI2258 SSD controller, and Toshiba TLC NAND for this SSD. Also, Plextor has opted for a Samsung DDR3 for the SSD’s cache on the 2.5-inch version. On the other hand, we found out that they are using SK Hynix’s DDR3 for SSD Cache on the M.2 version. The performance of the M8VC lives up to what Plextor claims. It was able to reach maximum sequential speeds of up to 565MB/s for the 512GB version and 555MB/s for the 256GB version. Generally, the 256GB version is only slightly slower than the 512GB version. For a real-world test, we opted to transfer the whole Steam game library from the 256GB SSD to the 512GB SSD. While at time, the speed reached over 500MB/s due to large individual files, the drive was able to consistently perform above 300MB/s. This performance should be similar when you are transferring a range of files across drives. We also took note that the drive still continues to perform up to speed even when we filled it up with files. Usually, SSDs tend to slow down when more files are placed within it, or when you have the operating system directly on it. This is not the case for the Plextor M8VC. The 256GB M.2 SSD was our OS drive, and it performed as per specifications even though it utilized by the operating system as well. Plextor claims that this is part of the SSD’s “TrueSpeed” technology, which sustains the SSD performance even after periods of use or when the SSD is nearly full. 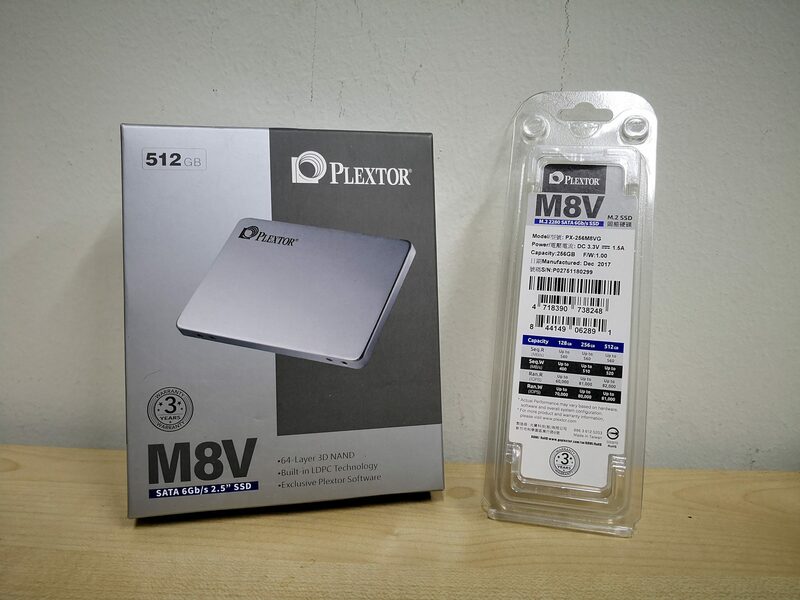 The Plextor M8VC is a no frills SSD that provides exceptional performance, despite it being a AHCI/SATA based SSD. Plextor’s commitment to reliability can also be seen with their promise to 3 years warranty and a 1.5 million MTBF rating on the M8VC. Regardless if you are upgrading from a hard drive, or simply looking for high speed storage solutions for your workstations, the Plextor M8VC is worth your consideration.